An Electrical Technician install, maintain, and repair electrical wiring, equipment, and fixtures. Ensures that work is in accordance with the electrical codes. Gulf Coast Industries are investing billions of dollars in capital improvements throughout the Texas Gulf Coast, home to over 200 chemical plants the largest petrochemical complex in the world. COM provides training that support these industry demands. The need for qualified Electricians in the Gulf Coast Region is anticipated to grow by 30.8 percent by 2022. The median hourly wage is $22.13 with entry level positions below that rate (Source: Workforce Solutions, 2017). 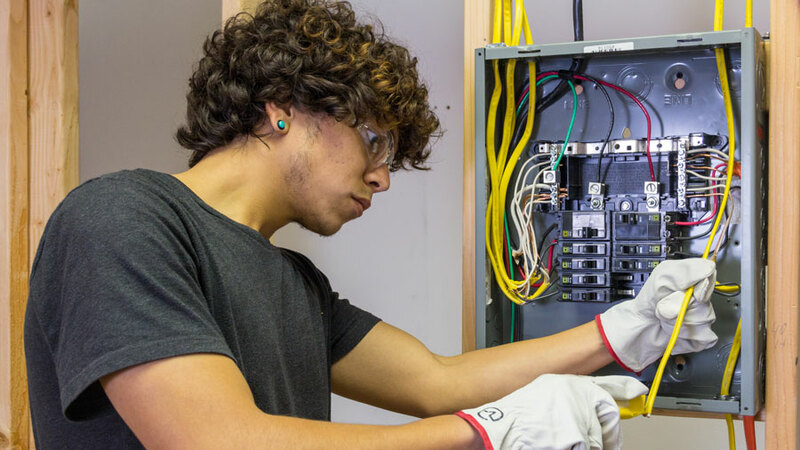 The Electrical Program prepares students for Entry-Level careers in a high-skill, high-growth occupation. Our instructors bring field experience into the classroom to provide instruction and hands-on training. Classes meet two nights per week to accommodate work schedules. The Electrical Program will follow the NCCER curriculum that is recognized by leading industry, construction, maintenance, and national associations. Students who successfully complete the courses will be listed in the NCCER registry that employers access for their recruitment efforts. Students completing this program will receive an Occupational Skills Award for Electrical I, NCCER and OSHA 10 Credentials. New students must register in person with COM’s Continuing Education Office located in the Technical Vocational Building #5, Suite 1475. Returning students may register by calling the CE Office 409-933-8586, in person or online at www.com.edu/register. Texas Public Education Grants (TPEG) – Assistance is based on financial eligibility and will pay up to 75% of tuition through COM’s Financial Aid Office. Hazelwood Act – Assistance is available to veterans, their spouses and eligible children and is available through COM’s Student Financial Services/Veteran Affair’s Office. Workforce Innovation and Opportunity Act (WIOA) – Assistance is based on financial eligibility and will pay 100% of tuition and books through Workforce Solutions. This course is a comprehensive study of NCCER Core for instrumentation students. This course introduces students to basic job site construction safety in residential, commercial and industrial construction. Students will also learn how to select and demonstrate the proper use of hand tools, portable and stationary power tools, and related construction equipment. Students will obtain their OSHA 10 certification and credentials for NCCER Core. This course is a comprehensive study of NCCER Level 1 for electrical. Students are introduced to mathematical applications used to solve problems in the electrical field. Students learn to use a calculator to perform operations involving fractions and decimals; compute percentages using ratio and proportions; convert unit values, solve simple equations, and calculate areas and volumes of geometric solids. Upon completion students will obtain credentials for NCCER Electrical Level 1. This course is a comprehensive study of NCCER Level 2-A for electrical. Students are introduced to basic direct current (DC) theory including electron theory and direct current applications. Upon course completion, students will be able to explain atomic structure and basic electrical values such as voltage, current, resistance and power as well as summarize the principles of magnetism. Students will learn to calculate electrical values for series, parallel and combination circuits and utilize electrical measuring instruments. This course is a comprehensive study of NCCER Level 2-B for electrical. Students will discover the different wiring methods for single-family and multi-family dwellings and learn to wire devices according to electrical codes. The course will cover load calculations, service entrance sizing, proper grounding techniques and associated safety procedures. Upon completion of the course, students will be able to compute the circuit sizes needed for the installation of circuits, feeders and conductors and demonstrate grounding methods and safe installation of ground fault circuits. Upon completion of Level 2 students will obtain credentials for NCCER Electrical Level 2.